FOXTROT as most people know is the name of a dance, which is performed a third through the film by a bored soldier at his deserted outpost. It is also known in the military to stand for the letter ‘F’ when spelt out as taught in signalling courses to prevent confusion in communication. (Alpha is for ‘A’, Bravo for ‘B’ etc.) In the film it is also the name given to a military operation. The film is divided into 3 parts, each almost equal in running time. The opening sequence is reminiscent of Steven Spielberg’s SAVING PRIVATE RYAN when a mother faints after hearing the news of her son’s death during WWII. The story begins at the home of Michael Feldman (Lior Ashkenazi) and his wife Dafna (Sarah Adler), where an army detail arrives with the news of their son Jonathan ((Yonatan Shiray). Dafna faints and is sedated. Meanwhile Michael spirals from anguish to anger. He even kicks his poor unsuspecting dog. Nothing new here, the film seems treading on water. The film picks up when he begins to suspect that he has not been told the whole story when the army refuse to let him see the son’s body in the coffin during the military funeral. Not soon after, there is news that the boy is alive. Apparently, there is another Jonathan Feldman and it is this other Jonathan that died. Michael freaks out and demands that his son be returned home right away. Michael and Dafna have an argument, she accusing him of being nasty, he of her being too nice being sedated on drugs. The film ends on a bright note, with a touch of surrealism. The second section begins with the narrator describing the foxtrot dance followed by a very uplifting and amusing dance sequence. The musical interlude jumps out of the blue and is a fantastic surprise. The audience then learns of Jonathan’s mundane military duties at the check post, identifying everyone that drives through. The soldiers also let a camel through. Writer/director Maoz pulls another trick up his sleeve with a twist in the plot. When a passenger in a car tosses out an empty drink can, the soldiers open fire thinking it to be a grenade. There are been more twists in the plot but they will not be mentioned in the review to prevent to many spoilers. A few of these twists could be reduced for the film to be more effective. The film works as a very different film audiences have never seen before. 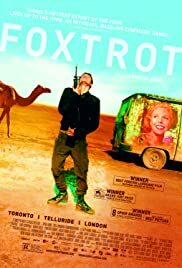 FOXTROT is a surrealistic film set in the midst of the israeli/Palestinian conflict, a very unlikely setting, which makes the surrealism work even better. Maoz’s story also shows that fate plays games with people’s lives – and there is nothing one can do about it. Michael and Dafna try to make sense of what is happening. At their best moment, as their daughter, Alma tells them: “You two look beautiful when you are together.” Perhaps, that is the only thing human beings can hang on to, each other in the midst of the quirky hands of fate. 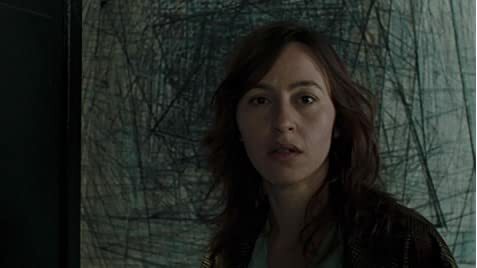 The film won the Silver Lion (Grand Jury Prize) at the 2017 Venice Film Festival. FOXTROT is definitely worth a look.